If your shop doesn’t have much need for permanent, heavy shelving units, than these plastic shelving units will suit your purpose to the T. It’s all about organization and working smarter in offices and workplaces these days. The best solution is the one that can adapt to what you need it to be. 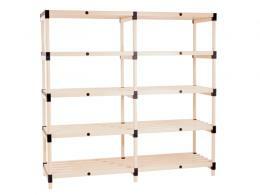 These plastic shelving systems can be assembled in just minutes. If you require a temporary storage solution, or simply a place to display your wares, then plastic shelving is the perfect choice. Its lightweight features and easy assembly means that it can be moved and installed in a different spot every day. It’s perfect for any showroom or front of house sale. It can be taken down even faster than its assembled meaning that it’s never going to be in the way. If you need it across the room tomorrow, it shall be done with ease. The mobility of these shelves makes it the perfect addition to your display at the next trade show. It’s going to set up quickly, and be a stable place to display your products. When the trade show is done, you can disassemble it and be packed away quicker than ever before. It also suits the retail store offering a promotion or discounted item on sale. 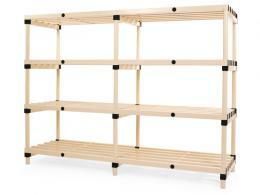 The shelving handles any lightweight item across several variants. Not only is it light weight and portable, it also is incredibly adaptable. It fits the room you have. You don’t need to shop around to find a shelving unit that suits your room; you can simply adjust this shelving to the shape you need it to sit. It can wrap around corners or extend the length of the wall if you combine several units together. 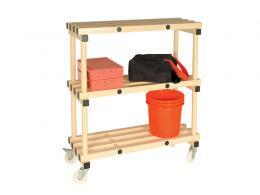 Find out more about how these plastic shelving units can suit your needs.